It’s a very important summer for Liverpool, as they try to maintain their status as championship contenders in the Premier League without spending too much but showing they’re more involved in the transfer market than before, with the likes of Alberto Moreno from Sevilla being on their shortlist and acting upon that wish. Reports in England suggest Liverpool have made an offer worth £16 million for the 21-year old left back while also including Suso in the deal as a loanee. Sevilla are unlikely to accept the offer, but if Moreno shows increasing pressure to move on to the Premier League, we might see things moving a bit quicker. Moreno is a left back who can also play well in a more attacking position on the wing, which might fit well with Liverpool’s attempts to play a 3-5-2 of sorts, that puts increasing pressure on wing backs to deliver on both ends of the pitch. Glen Johnson isn’t someone that should be trusted for a team that has new and bigger ambitions than the ones they started out with last season, and Jon Flannagan is likely to be moved back to his natural right side. Moreno is a better player than Flannagan is on the left side and than Aly Cissokho who lost his place in the lineup midway through the season. Jose Enrique is still on the team, but he seems to be no more than backup at this point, while Moreno, who has already been capped twice for the Spanish national side and right now is part of the squad that is going to the World Cup, is one of the hottest names in Spanish football. 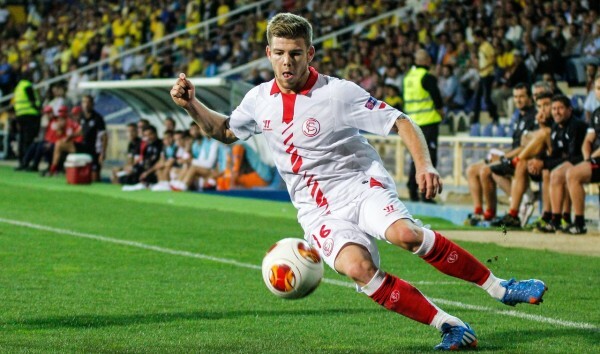 Moreno played in 28 league matches for Sevilla last season, scoring 3 goals. He also played in 12 Europa League matches, providing two assists and being part of the group that ended up winning the title against Benfica in the final. Liverpool signed a Sevilla player last season – Luis Alberto, which might make this transfer a bit easier to smooth over as the previous interactions between the teams went well.